Look who shadowed me at Nate and Sam's reception Sat. . . Oh and just FYI. . . Nate and Sam are friends of ours, Raleigh was INVITED to the wedding. 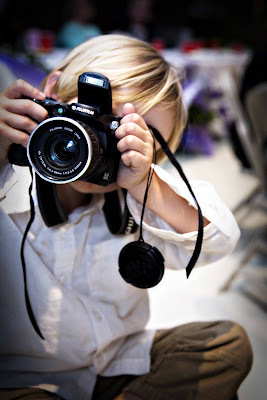 I will not bring my 4 year old along to shoot with me at your wedding. I love your blog! I found you somewhere through the grapevine. Thanks for all of the fun posts! I LOVE this photo and I LOVE his professional outfit. P.S. you are sick.....naming your SON benjamin Lynus. What's wrong with you?! That poor poor child! HAHAHAHA! I have thought about setting up a photo blog, and I loved the picture you have for your header. Can you please, please, tell me how you designed it? I know you're SUPER busy, but I would greatly appreciate it! Jake Kongaika. He designed that header. He is fantastic. He will design a header for you for $50! A steal! He is great at coming up with concepts that compliment your photography, and he'll totally make a second and third pass until you're perfectly satisfied. Best to you in the Blogosphere! How cute is that. We need to see more of his pics!